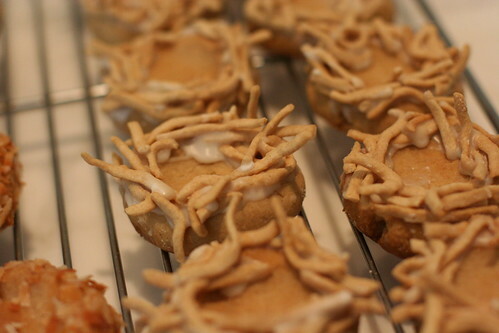 This year I attempted to make my nest cookies look more nest-y. Mission accomplished, I do believe. I used crunchy chow mein noodles for some and toasted coconut for the rest. The chow mein noodles were a pain to "glue" on (I mixed powdered sugar and milk to make a glue.) They were pretty much assembled one noodle at a time. I did it in front of the TV. Bryce and I are back to Breaking Bad again. That Walt, can't seem to stay out of trouble. The girls glued the eggs in the next day. 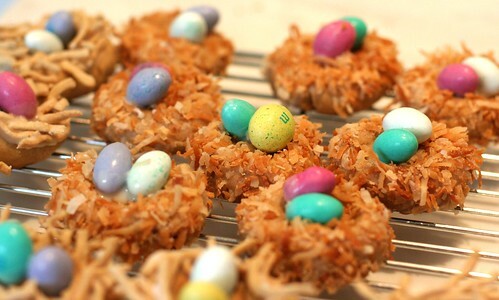 Anyhoo, the toasted coconut was much faster, better tasting and easier to eat. The girls prefer the chow mein noodles. 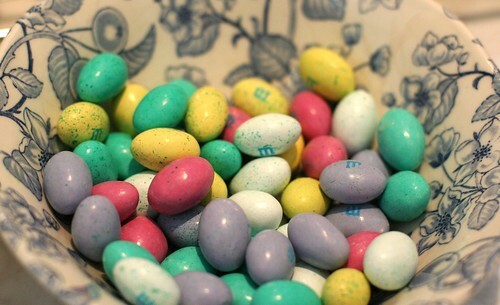 For the eggs I used M&M chocolate candy eggs. I wish they were smaller. We're taking these to a flashlight egg hunt tonight. Doesn't that sound fun? This is the first time I've heard of such a thing. I think the girls will love it! 1) Bake a batch of Thumbprint Cookies. These are the same ones I make every Christmas; minus the chocolate filling, of course. 2) Stir together about 1/2 cup powdered sugar with a teaspoon milk. Add 1 drop at a time until a glue like consistency is reached. 3) Frost the out side of the cookies with your "glue." 4) Quickly place chow mein noodles or toasted coconut on the "glue." 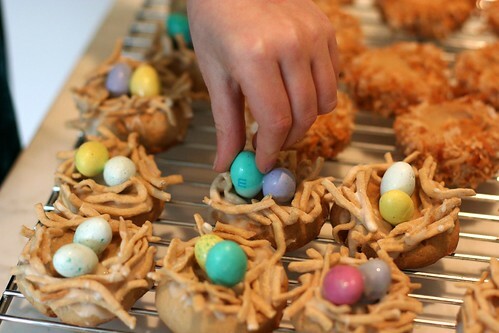 5) Spoon a little "glue" in the nest and place mini eggs, jelly beans or the like. 6) Let harden in the air then place in a container. Hope you have a Happy Easter! Those toasted coconut cookies are right up my alley. 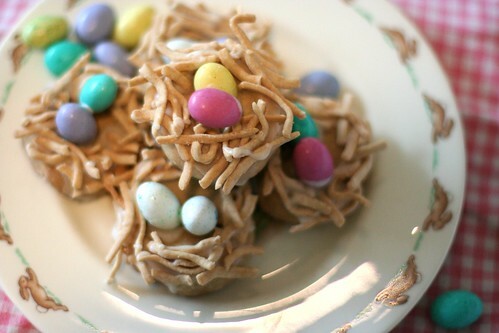 I made some nest cookies with shredded wheat, marshmallows and butter. Lets just say they were a bit "healthy" tasting.... but they certainly did look cute. ooh never thought of adding the noodles one at a time! so cute! 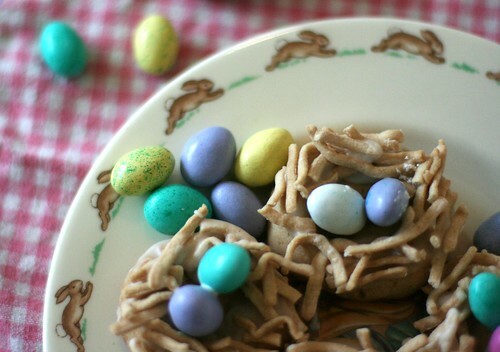 here we just mix the noodles with melted chocolate and make a nest that way. yours look so beautiful and a flashlight egg hunt sounds wonderful. My girls would totally love that! Next time use marshmallow with the noodles like you would for rice Krispy treats. Very simple. My kids loved them. You can also make a chocolate version by mixing in chocolate chips.